Black Friday provides exciting deals on electronics, web hosting, WordPress themes, plugins, and others. The online marketplaces offer products at cheaper rates that let you make huge savings in shopping ahead of Thanksgiving or Cyber Monday. Today we’ll list the best Black Friday and Cyber Monday deals in 2018. Be ready to pick your favorite gadget or website related items during this festival season. Microsoft’s Surface Go Laptop comes with 8GB RAM, 128 GB internal storage, Windows 10 Home OS, and 9 hours of battery backup. It can be used in laptop, tablet, and studio modes. Surface Pro 6 is another top-class laptop from Microsoft. It has Intel Core i5 processor, 8GB RAM, 128GB RAM, and other technical configurations required to deliver ultimate speed and performance. The device offers up to 13.5 hours of video playback and all-day battery life. Aspire E 15 is a powerful, stylish laptop from Acer. It has an 8th generation i7 processor, 8GB RAM, and 256GB storage. The device is preloaded with Windows 10 Home OS and offers 15 hours of battery life. NVIDIA GeForce MX150 with 2 GB of dedicated GDDR5 VRAM will take you to the next level of entertainment and serves high-resolution videos, games without any interruptions. Apple iPad has a 9.7″ retina display, A10 64-bit fusion chip, 8MP primary camera, and a 1.2MP secondary camera. This Wi-Fi enabled device comes with a TouchID fingerprint sensor and 10 hours of battery backup time. It’s available in silver and grey colors. Samsung Galaxy Note 9 is a perfect gift for technology enthusiasts. It has a large 6.4″ Super AMOLED display, 128GB/512GB internal storage variants. Android 8.1 OS Oreo, 2.7 GHz Octa-Core processor, expandable storage for up to 512 GB, 4000 mAh battery are other major features of this Samsung flagship device. Samsung Smart TV is available in different sizes from 49-inches to 82-inches with and without soundbars. It will bring movies and videos to your real life by serving them in a 4K environment. Flat 360-degree design, UHD quality, and advanced controls make it a perfect asset for your home entertainment. Sony Smart LED Tv is another option to enjoy stunning movies and videos from your home. It is available in 65″, 75″, and 85″ sizes with soundbar and Blu-Ray player. 24.3 MP camera with full HD video, 6.5 fps abilities, and built-in Wi-Fi connectivity. It is one of the best Digital SLR cameras in the market now. HostGator is the popular name in the web hosting field. They provide fast, reliable hosting and attractive plans for WordPress users. It is easy to use and offers unlimited space for domains, emails, bandwidth etc. A2 Hosting is one of the best places to host your WordPress website or blog. They adopt modern technology standards and deliver world-class service in WordPress hosting sector since 2003. Founded in 1998, iPage is a leading choice for WordPress hosting services. They deliver a wide range of services and tools to manage your WordPress website from a single place. Media Temple is a one-stop shop for all your web development needs — you can buy domains, design and host websites, buy SSL certificates and more. As they provide everything you need to launch a website, you need not approach another company for another service. Founded in 2008, Green Geeks is one of the most trusted, reliable and cheap hosting providers. 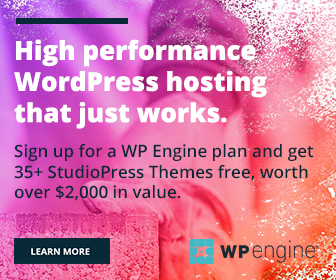 They offer WordPress hosting services with top-level performance and incredible features. WP Engine is specialized in WordPress hosting as the name indicated. It was founded in 2010 and has become a leading web host in managed WordPress category within a short period. Namecheap is one of the best places to buy website related products like domains, hostings, and others. The dashboard is easy to manage and, you can design and host sites at affordable rates here. MyThemeshop provides free as well as premium WordPress themes and plugins with a bunch of modern features. Their customer support is laudable that address all your grievances without any waiting period. Offer: Save 99% during this festive season. You can buy all their themes and plugins for just $99.47 (worth $8,900) now. Envato Market is a popular place to get themes and plugins of any kind. It offers hundreds of themes, plugins, and other essential tools for designing your blog. Many leading theme developers are selling their products through Envato market to reach the maximum audience and increase sales. Template Monster is one of the best sources to buy premium website products. They have more than 26,000 well-crafted themes to give a unique touch to your online platform. AThemes is another place for premium WordPress themes. Their themes are fast, modern, and provide unparalleled mileage and class value to your business website. Themify offers high-resolution, search engine friendly WordPress premium themes at affordable rates. All their themes come with easy to use drag and drop builder that lets you create any kind of layout in your dreams. WP-Rocket is an amazing optimization plugin for WordPress. It lets you optimize the each and every part of the site to improve its performance and load the pages at a blazing speed. The plugin offers many advanced tools and features to clear your cache files and reduce the size of the database. MemberPress is one of the leading WordPress membership plugins to make money from your website. It is a powerful plugin that helps you create, manage membership plans and track users from a single dashboard. It is a premium plugin to add and track your affiliate marketing links. Pretty Links Pro will generate short pretty links automatically, tracks the number of clicks along with the detailed report of user location, IP address, browser, operating system etc. SocialPilot is a great tool to schedule contents on Facebook, Twitter, LinkedIn, Google+, Pinterest, and Tumblr blog. The posts can be shared on Facebook pages, groups, and LinkedIn pages as well.